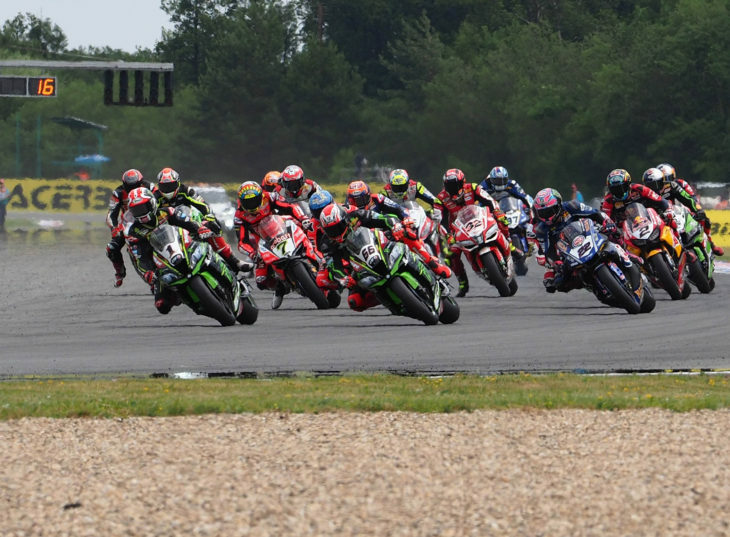 The WSB championship will add an additional “sprint race” to each weekend round held in 2019. Apparently intended to increase fan interest (and, perhaps, TV revenue), the three-race format will certainly keep riders busy when combined with the usual practice and qualifying sessions occurring each weekend. In a bold move to save SBK racing, I heard they contemplated having Johnny start last in the sprint race, but ultimately settled on leaving him out altogether. It’s the only way to have a race he won’t win. I would rather see World Supersport go to two races per weekend. Just a thought.. I already don’t care about WSBK because of the 2-race format. So…. Too many races for me, I don’t think it’s serious-minded. I was ready to hate this, but it actually sounds cool. Full on sprint just riders trying to pump out all out laps for 8-9 laps sounds kind of awesome. I love strategy, but I also love balls out racing. Only concern is risk of injury to riders. Tom Sykes might win a lot of these. He can be very fast in short distances, but can’t conserve tires as well as Rea over a full race. This is WSBK trying to give other racers an opportunity to win. Rea’s dominance, one can argue, and some of the Dorna/SBK have stated, is not necessarily good for WSBK. Especially since Kawasaki, and I’ve stated this before, isn’t in MotoGP. The other factories are focusing on MotoGP and not so much WSBK, if at all. But Kawasaki has been putting all their money on Rea. In that regard, and I’m a Rea fan, so no haters please, but Rea’s titles need an asterisk next to them. *Kawasaki backed out of MotoGP to put all its money in WSBK. Just think if the other factories decided to make WSBK their focus. Anyway, these short sprint races are going to be harder for Rea to win because others like Sykes won’t have to worry about tire wear. Could be a lot of fun! “not necessarily good for WSBK”? Definitely not good for WSBK. I have stopped watching because of Rea. Who wants to watch him win every week? Even if you are a fan you can’t think this is good racing. I agree with you. I’ve stopped watching it too. It used to be so great about 8-10 years ago. Now I just read the post race news report. You are so right. Remember the 2008 Monza round? Race 1, Max Neukirchner, Noriyuki Haga, Troy Bayliss and Yukio Kagayama. Kagayama finished fourth and he was only 0.771 off the winner. Race 2 Max was 2nd by 0.009 and Kiyonari was 3rd, 0.051 sec off the winner. Man that was some awesome racing! Wish we could get that back. This could actually be pretty interesting. No need to be concerned with tire preservation. Risky to stay behind an opponent for too long in an attempt to gauge strengths and weeknesses. I’m intrigued and might actually watch a few WSBK races to check it out which I’m sure is what they were hoping for with this. Geez. I heard that if this third race “works out” they’re going to add a figure 8 race, you know, to get the fans excited. Unfortunately, Rea will probably win those too. Seems like an answer to a question no one ever asked. Money. Always about the money. More races, more money. More tv coverage, more money.